What are the important Characteristic features of Phylum Porifera? Phylum Porifera belong to In-vertebrata of Kingdom Animalia include exclusively aquatic animals Sponges. Even though these animals are primitive animals in Kingdom Animalia show some very peculiar characteristic features. In this resource, I discussed in detail about the various important characteristic features exhibited by animals of this Phylum Porifera. Phylum Porifera exclusively include only one animals Sponges which are aquatic in nature. The word Porifera is derived from two Greek words i.e. Pori=Pores and ferros=bearing. So these are numerous pore bearing animals. Scientists have identified some 15,000 living species and 1,400 fossil species in this phylum. Out of these some 150 species are fresh water Sponges. Sponges are multi cellular, eukaryotic, heterotrophic organisms with no tissue grade level of organization. They are thought to be evolved from colonial Protozoans and so they are more complex than Protozoans. This Phylum include exclusively aquatic animals Sponges which live mostly in salt water (marine) and a few species live in fresh water. Sponges unlike other animals are sessile and sedentry. i.e. they are fixed or attached to some hard substratum like rocks. Their sizes range from microscopic to over 3.5 meters across. Some marine species grows to the depths of 8,800 meters beneath water. Examples:- Fresh water Sponges:- Spongilla, Marine water Sponges:- Leucoselinia, Euplectella, Poterion, Euspongia, Grantia, Scypha etc. Sponges are irregular in shape, tree-like or sometimes cup like. Sponges possess Asymmetry i.e. we cannot cut the body into two equal halves from any angle. Some species of sponges show radial symmetry where the body can be cut into two equal halves through one plane only. The entire body surface of Sponges are covered by pores called Ostia and at the upper end of Sponge is provided with a large opening called 'Osculum'. Porifers are multi cellular organisms but they have not attained tissue grade level of organization. But cells present in Porifers are differentiated to form specialized cells to perform certain special functions. So Porifers are Cellular grade Metazoan animals. Body wall of sponges include two thin layers of loosely arranged cells-the outer dermal epithelium and an inner gastral epithelium. A non-cellular gelly like layer Mesohyl is present between these layers. The outer layer is lined by epithelial-like cells called Pinacocytes and the inner layer is lined by collar cells called Choanocytes. Most cells of these layers are totipotent and change into any type of cells for various functions is the key for the success of sponges. Exoskeleton can be found in the form of Calcium Carbonate or siliceous Spicules and a collagen made spongin fib-res. Spicules and spongin fib-res present in Sponges maintain their body shape and keeps the pores of the Sponge opened. A large cavity present inside the body of the Sponge is known as Spongocoel. Ostia, the connection between ostia to spongocoel and then osculum together form Canal system. Water current in the body is maintained by Canal system of the Sponge. In coming water current flowing through ostia to the canal system will bring food particles which include detritus, plankton, bacteria. This method of collecting food through drawing water current by Sponges is known as filter feeding. Pinacocyte cells and Choanocyte cells of the body wall of Sponge ingest food particles by Phagocytosis. Cells of the sponges also absorb dissolved nutrients from water. Digestion in Sponges is intracellular i.e. digestion of food particles occur inside the cells but not in the body cavity spongocoel. The digested nutrients are distributed between the cells by diffusion method. Sponges have no circulatory or nervous system. 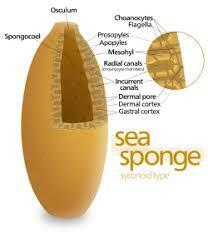 But sponges show small responses to stimuli by some modified body cells which act like sensory cells. 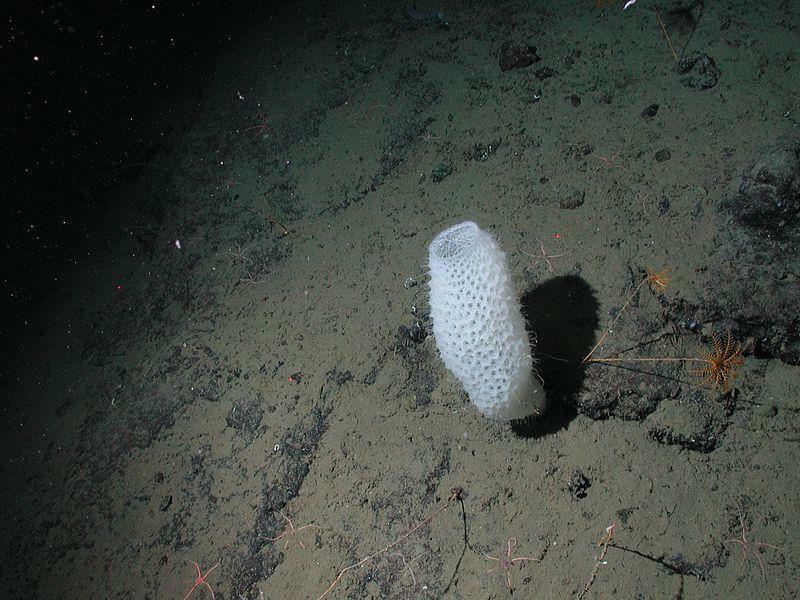 Sponges have no special excretory organs or excretory system. So carbon dioxide produced in the body cells will be diffused into water. Similarly, the metabolic nitrogenous wastes produced in the cells of sponge diffuse into water which passes out through osculum. Sponges reproduce both asexually and sexually. Asexual reproduction in Sponges occurs through fragmentation, bud formation or gemmules. Buds and gemmules in sponges are formed by their body cells itself. Gemmules are resistant internal buds formed in sponges and are capable of forming sponges. Sexual reproduction in sponges occurs through gametes. Sponges are monoecious or hermaphroditic i.e means individuals will produce both male and female gametes. Modified body cells will produce female gamete egg and male gamete spermatozoa. Fertilization occurs by the medium of water in the body of sponge. Early development of larva occurs in the body of sponge and free swimming larva will be released into water through osculum. Larva develops into an adult and attach itself to the substratum later. Sponges show extraordinary capability to regenerate not only from damaged or lost parts but also from small fragments and cells of adult body. Body wall is made up of two thin layers with middle non-cellular Mesohyl layer. Porifers lack well developed digestive, circulatory, nervous and excretory systems. Sponges have highest capacity of regeneration power.